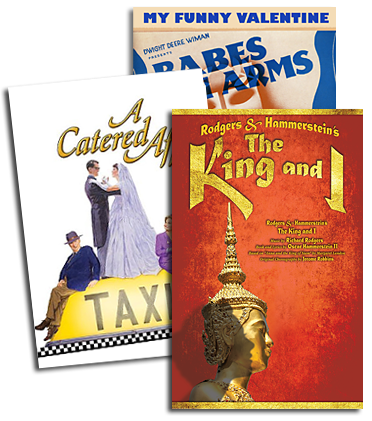 BUSTIN' OUT ALL OVER: In reviewing the season just past, Variety reported: "The comeback of the year award- both on Broadway and the road- has to go to Oscar Hammerstein II who, like Sir Andrew Lloyd Webber, currently has three shows on Broadway (SHOW BOAT, THE KING AND I and STATE FAIR) and two on the road (SHOW BOAT and CAROUSEL)"...The two Rodgers & Hammerstein shows that joined SHOW BOAT on Broadway premiered back-to-back this spring, adding significance to the ritual passing of the "gypsy robe" from one musical's chosen dancer to the next, as STATE FAIR's Donna McKechnie bequeathed the momentous garment to THE KING AND I's Lydia Gaston...Trivia mavens will note that the last season to host at least two R&H shows simultaneously was 1959-60, when THE SOUND OF MUSIC joined FLOWER DRUM SONG in their original runs. THAT'S FOR ME: STATE FAIR made its Broadway debut in March (see cover story), and recorded its original cast album in April. 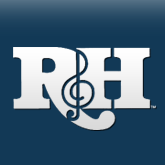 Produced by Hugh Fordin for DRG Records, and slated for a June release, the album features several R&H recording premieres along with versions of such standards as "A Grand Night for Singing," "That's For Me," and "It Might as Well Be Spring," sung by the original Broadway cast including John Davidson and Andrea McArdle...R&H Director of Music Bruce Pomahac created the orchestrations, and served as Associate Producer on the album. CAREFULLY TAUGHT: Oscar Hammerstein's words and lyrics are being used to enlighten students on issues of intolerance, racism and bigotry in ALL KINDS OF PEOPLE, an hour-long program that includes excerpts from many of his musicals...Developed in New York by the Midtown Management Group, a non-profit educational program that brings Broadway and the New York City public school system together under the guidance of Executive Director Michael Presser, ALL KINDS OF PEOPLE was conceived for four performers with piano accompaniment and combines musical scenes with audience participation and discussion... Following a successful trial run in May, and a special performance before 1200 students at Manhattan's Town Hall auditorium, ALL KINDS OF PEOPLE resumes its tour of New York City public schools in the fall; further inquiries should be made to The R&H Theatre Library. RADIO DAYS: Continuing its series of star-laden broadcasts of American musicals, BBC-2 Radio will follow up last summer's CAROUSEL starring Mandy Patinkin with a full-orchestra, in-studio presentation of THE KING AND I this summer, starring Barbara Cook and Frank Langella, scheduled for airing in Great Britain in July. HOLLYWOOD AT HOME: As a worthy successor to its lavish 1994 laser disc reissue of THE SOUND OF MUSIC, 20th Century Fox Home Entertainment has issued a deluxe (40th) Anniversary Collector's Edition of THE KING AND I starring Deborah Kerr and Yul Brynner...Restored in a THX-approved, wide-screen format, the gift box's supplementary materials compiled and produced by Michael Matessino include audio commentary from screenwriter Ernest Lehman and Hollywood Bowl Orchestra maestro John Mauceri; documentary interviews with film participants Carlos Rivas and Yuriko, along with this organization's Mary Rodgers, James Hammerstein and Ted Chapin; a newly-minted, 24-K gold compact disc of the Academy Award winning soundtrack; Movietone newsreel shorts and theatrical previews; an annotated history of the film production; behind-the-scene photos; etcetera, etcetera, etcetera...Meanwhile, the well-received Easter broadcast of A&E's two-hour documentary on all the R&H movie musicals, THE SOUND OF MOVIES, hosted by Shirley Jones (featuring out-takes, newly discovered footage and more) is now available on A&E Home Video; call 1-800-423-1212. VENUS MAKES A STAR: At Encores!, the annual series of great American musicals in concert at New York's City Center, ONE TOUCH OF VENUS, the Kurt Weill/Ogden Nash/S.J. Perelman fantasy, turned into a love fest with Venus herself when critics and fans alike fell under the spell of this bewitching 1943 musical comedy's new star, Melissa Errico...Her turn as Venus during four performances in March provoked an ecstatic response that recalled the excitement of Broadway gone by- love letters in the press columns, entrance applause at Sardi's, and scripts pouring in from both coasts. Errico was previously known for roles ranging from the Princess in Encores! CALL ME MADAM last season to the devious tabloid reporter on CBS' CENTRAL PARK WEST this year; "I'm a Stranger Here Myself" she sang in ONE TOUCH OF VENUS but, evidently, won't be one for much longer. FROM TOKYO TO BERLIN: To commemorate its role as new representative of the Irving Berlin music publishing catalogue in Japan, Shinko Music and its President, Shoo Kusano, hosted an "Irving Berlin Celebration" in Japan in May...Maxyne Berman Lang, President of Williamson Music (which oversees the Berlin catalogue worldwide) and Linda Emmet, Mr. Berlin's daughter, were special guests at the festivities, which included interviews, press conferences and meetings with recording artists. FOR THE RECORD: To coincide with the ANNIE GET YOUR GUN 50th Anniversary this spring, John Yap's JAY Records has issued a new, 2-CD recording of that score's 1966 version starring Judy Kaye and Barry Bostwick...Dawn Upshaw's new album, DAWN UPSHAW SINGS RODGERS & HART, features 15 numbers, rarities and standards alike, with musical direction by Eric Stern, and is scheduled for release by Nonesuch Records in Europe this summer, and in the U.S. this autumn...Also due out this fall: SOMETHING WONDERFUL- Bryn Terfel SINGS RODGERS & HAMMERSTEIN, from Deutsche Grammaphon...While he was "this close" to starring in the movie of CAROUSEL, Frank Sinatra never made it into a Rodgers & Hammerstein musical- but he did record lots of their songs over the years, and Columbia Legacy has put a set of these together on a new compilation, FRANK SINATRA SINGS RODGERS & HAMMERSTEIN, in stores this summer...THE HOLLYWOOD BOWL ON BROADWAY, the newest album from John Mauceri and the Hollywood Bowl Orchestra, features orchestral suites from Broadway scores by Richard Rodgers, Jerome Kern, Kurt Weill and others (Philips Classics, July)... FLOYD COLLINS, the new musical by Adam Guettel and Tina Landau, presented Off-Broadway this spring and winner of the Lucille Lortel Award for Best Musical, was recently recorded by Nonesuch Records with a release date to be set...The cast album of another acclaimed, award-winning Off-Broadway musical, WINGS, by Jeffrey Lunden and Arthur Perlman, will be released by RCA Victor in August...Three new recordings of THE SOUND OF MUSIC are in circulation, from current productions in Greece, Israel and Sweden; the Greek translations flow nicely, the Hebrew verses are charming ("So Long, Farewell" becomes "Shalom, Shalom") and the Swedish album is a gold record in its host country, with headliners Tommy Krberg and Carola sharing the entire score of their hit production (now heading into its second year), highlighted by a Krberg rendition of "Sk dig till bergen" ("Climb Ev'ry Mountain") that is positively hair-raising. GENIUS CHILD: Williamson Music composer Ricky Ian Gordon has created two new songbooks (piano-vocal), both published by Williamson Music this spring- A HORSE WITH WINGS: THE SONGS OF RICKY IAN GORDON, with 21 titles included, marks the first printed anthology of his works; GENIUS CHILD, "a cycle of 10 songs for high voice," based on the poetry of Langston Hughes, was first commissioned by soprano Harolyn Blackwell in 1992 and featured on her RCA Victor debut recording, STRANGE HURT...Upcoming for Gordon: a chamber opera for Houston Grand Opera and the American Music Theatre Festival based on The Tibetan Book of the Dead in collaboration with playwright Jean-Claude van Itallie (summer '96), and a recital by contralto Nuala Willis accompanied by Jonathan Dove for London's Almeida Festival in July.